The use of aborted fetal tissue has sparked controversy in the United States, but many scientists say it is essential for studies of HIV, development and more. Every month, Lishan Su receives a small test tube on ice from a company in California. In it is a piece of liver from a human fetus aborted at between 14 and 19 weeks of pregnancy. Su and his staff at the University of North Carolina at Chapel Hill carefully grind the liver, centrifuge it and then extract and purify liver- and blood-forming stem cells. They inject the cells into the livers of newborn mice, and allow those mice to mature. The resulting animals are the only ‘humanized’ mice with both functioning human liver and immune cells and, for Su, they are invaluable in his work on hepatitis B and C, allowing him to probe how the viruses evade the human immune system and cause chronic liver diseases. Meredith Wadman explains how fetal tissue is used in research, and how undercover filming has thrown such research into the public eye. An explosive climate has surrounded US research with fetal tissues since July, when an anti-abortion group called the Center for Medical Progress in Irvine, California, released covertly filmed videos in which senior physicians from the Planned Parenthood Federation of America bluntly and dispassionately discussed their harvesting of fetal organs from abortions for use in research. Planned Parenthood is a non-profit women’s health provider that received US$528 million of government money in 2014, much of it in reimbursements for services ranging from contraception to cancer screenings, which it provides largely to poor women. Abortions, which are performed at about half of Planned Parenthood’s 700 clinics, constitute 3% of its services. A handful of clinics in two states supply fetal tissue for research. The videos provoked a furore that has intensified over the past few weeks. On 3 December, the Republican-led US Senate voted to strip Planned Parenthood of government funding. This is despite the fact that fetal tissue research is legal, the US National Institutes of Health (NIH) has been funding it for decades and President Obama is sure to veto the bill, should it reach his desk. A few days earlier, on 27 November, a gunman shot dead three people at a Planned Parenthood clinic in Colorado Springs, Colorado. In a post-arrest interview, the suspect is reported to have said “no more baby parts”. The episode has shone a spotlight on a little-discussed arm of biomedical research, raising the questions of why, how and how widely fetal tissue is used. To find out, Nature turned to an NIH database of research grants funded in 2014 to find those using fresh human fetal tissue, and in October contacted 18 researchers working with it. Su was one of only two who were willing to be interviewed. Most requests were declined or went unanswered; a public-affairs officer at one major Texas university refused to have a researcher speak to Nature to keep that person “safe”. 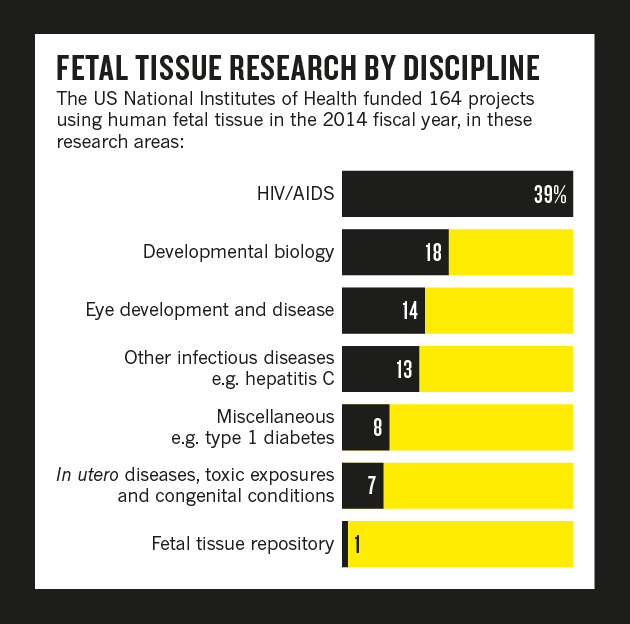 The figures show that in 2014, the NIH funded 164 projects using the tissue, at a cost of $76 million. This is slightly less than half of what the agency spent on work with human embryonic stem cells (ES cells), which has also been highly controversial, and 0.27% of the $27.9 billion it spent on all research. (By comparison, the UK Medical Research Council spent 0.16% — £1.24 million ($1.9 million) — of its total spending on research on five projects involving fetal tissue in the 12 months up to 31 March 2015.) Analysis of the NIH projects shows that the tissue is used most heavily for research on infectious diseases, especially HIV/AIDS; in the study of retinal function and disease; and in studies of normal and anomalous fetal development (see ‘Fetal tissue research by discipline’). But supporters of the research counter that fetal tissue is legally obtained, that it would otherwise be destroyed, that such work has already led to major medical advances and that, if there were better alternatives, they would turn to them. “Fetal tissue is a flexible, less-differentiated tissue. It grows readily and adapts to new environments, allowing researchers to study basic biology or use it as a tool in a way that can’t be replicated with adult tissue,” says Carrie Wolinetz, the NIH’s associate director for science policy. Some argue that the entire episode represents a thinly cloaked attempt to attack and limit access to abortion by eroding support and funding for Planned Parenthood. “People are talking about fetal tissue, but really what this discussion is about is abortion,” says Shari Gelber, a specialist in maternal–fetal medicine at Weill-Cornell Medical College in New York City, who has argued for the value of the research.